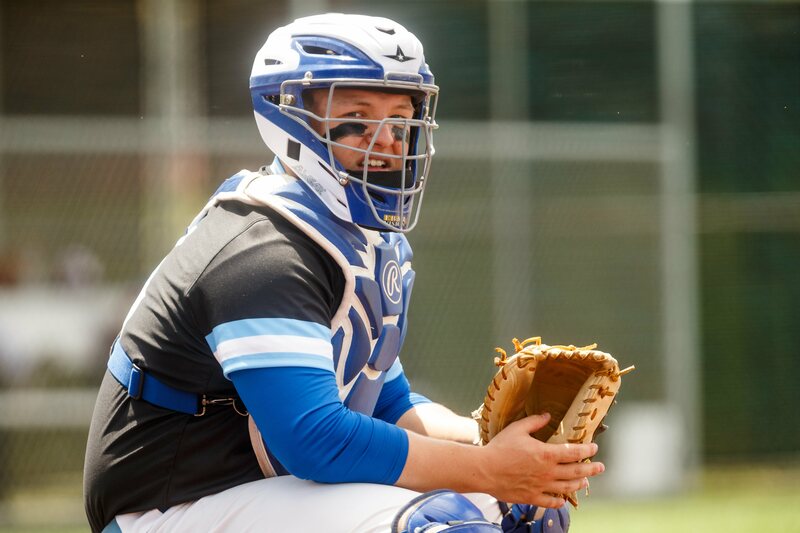 Having a catcher who is good defensively, has a solid throwing arm and hitting skills is a coach's dream come through. 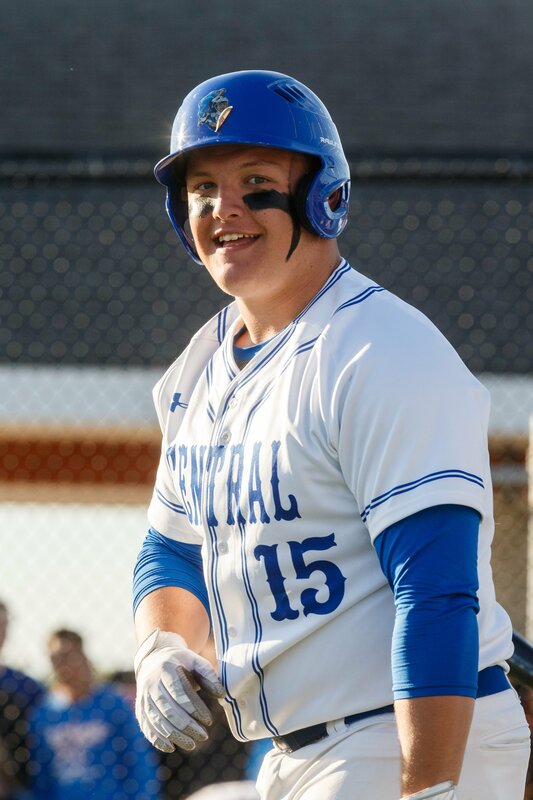 Now add leadership skills to that formula and you understand the smile the comes to Brookfield Central Coach Jeff Bigler's face when asked about M.J. Houdek. Bigler had a glowing scouting report on Houdek before a recent game at Brookfield Central's outstanding baseball facility. The first thing a coach wants from his catcher is defense and Houdek brings a full plate to the table according to Bigler. "First of all, he has done just a tremendous job of framing this year, getting the pitchers some extra strikes, maybe on the edges," Bigler said. Houdek also makes a habit of knowing his pitching staff, especially during a game. "This year he has been such a tremendous leader, just making sure the pitchers don't loose their frame of mind," Bigler said. If a pitcher gets out of his comfort zone and you can tell he's getting a little bit uneasy, he'll go out there without us even having to tell him. You can tell he just has that presence to know when his pitcher is not performing at the level." Houdek also protects his catches by keeping track of the opponents base runners. "He has a plus arm across the diamond," Bigler said. "His ball gets across - he's somewhere in that 2-2.1 seconds range which is what is what you want to see in anyone." Houdek shared his routine with the day's starting pitcher and talked about how they work together with pitching coach Jeff Mierow. "Before the game, the pitcher and I will go down to the bullpen about 20 minutes and pitching coach (Jeff Mierow) will go with us," Houdek said. "On our way back to the dugout we'll talk about if we want to work backwards, is there a certain guy in the lineup we have to worry about, if there's a specific plan for him. Normally if they Ipitcher warming up) can't find a spot within 5 or 6 pitches, you can tell that pitch is not working that day. If those pitches are on, then you know we can use those pitches. "Once we get into the game, coach Mierow calls pitches from the dugout and if the pitcher isn't comfortable with what was called he can shake it off. It's my pitch to work with after that." Houdek is proud of his work behind the plate. "I have a pretty strong arm. I feel really comfortable in my arm strength," he said. "I'm very vocal out there, so feel I can help my teammates out. Yelling that runners are tagging up on fly ball or where the ball is going when it's being brought in or where the infielder should go. I feel I can direct traffic when I'm back there." Photo by Alan Herzberg, SportsPhotos LLC --- Defense and handling pitching staff big part of MJ Houdek's game. After starting his career at shortstop/third base and pitcher until he was 12 years old, then Houdek started to catch. "I started to catch more and at age 13 and at age 14 I decided to move behind the plate for good. I either DHed or caught. I love catching. "You're always in the game. "When I was playing third, you'd maybe get three or four balls hit there a game. As a catcher you got to be in on every pitch. You've got something to do, whether you're framing a pitch, calling a game or trying to throw somebody out. You're always involved and I felt I could have a much bigger on the impact of the game catching than I did playing third or playing the outfield." Houdek first played Tee-Ball Park & Recreation team when he was 4 years old and then played in the Elm Grove Little League when he turned 6 years old. "I just fell in love with it," Houdek said of baseball. "In football, the kids that have the most success are like freak athletes, kids who are super strong, super fast. Anyone can be good at baseball if you're sound fundamentally. Everyone could have success at that. "It's what made me fall in love with the game. I was never this freak athlete kid, but I did pretty well in baseball. I really loved the game and that's what endeared baseball to me." Houdek played club baseball his freshman and sophomore season, but Bigler was aware of his baseball skills. "The guys were working out in the off-season at a place called the Sandlot in Waukesha," Bigler recalled. "He started showing up there and you keep an ear to the ground and listen to what the kids are talking about. When they told me M.J. is going to be coming out this year, I knew he was a good catching prospect. "I showed up to observe a few times and noticed what he could do right away. His skills just kind of jump out at you. He had that baseball skills set that you really like to see in ballplayers." One of those skills sets is hitting. "I feel I'm a pretty solid hitter throughout," Houdek said. "I have a good mix of power and contact. I'm not super fast, but I feel like I don't have a whole lot of weaknesses." Bigler liked what he saw with Houdek at the plate. Photo by Alan Herzberg, SportsPhotos LLC--- M.J. Houdek is one of the Lancers captains this year. "He does a good job in all facets. I would say he has plus power. I feel like he hits to all fields. which is good to see," he said. "He doesn't try to pull the ball too much. He tries to hit the ball where it's pitched. "I talk to him as a hitting coach that when he plants that front foot to make sure he gets his hands in a little better power position or a little higher so he can get on top of that high fastball that at times he has trouble catching up to. As a result, he will get a fly ball when he should be hitting a line drive." Bigler is also impressed with M.J.'s thought process at the plate. "He works the count well," he said. "He hits situationally. He knows when he needs to hit a ground ball with a guy on third and the infield back. He's done this already this year which is great. "He doesn't try to do too much. Just because he's a big kid, you might think he's a home run hitter. No one in high school is a home run hitter." The Lancers have 19 men on the roster, which includes 6 captains - 4 seniors (Houdek, Michael Panos, Jonathan Osman, Michael Hinz) and 2 juniors (Adam Baade, Zach Heckman). "We have a lot of leadership on this team - we have a very big team," M.J. said. "They make sure these guys have someone to talk to if they are unsure about something and they don't want to go to the coach. We have so many guys who can lead. So many guys who do what is expected as captains." Houdek is one of those leaders and it is a responsibility that he enjoys. "This is my first year and it means a lot to me," he said. "It means the coaching staff has recognized me and the other five of us - guys who can lead this team and set a tone, especially coming off last year (5-15, injury-riddled team)." Houdek feels communication is important, but he knows where his focus is with 5 other captains. "I'm comfortable helping someone with things I can correct," he said. "I wouldn't want an outfielder who tells me how to catch and I wouldn't try to tell a outfielder how to play the outfield. If I see anything I feel I can fix, I would try and correct that." Bigler is also pleased with the leadership skills Houdek's has shown. "He's stepped up in that category, which the team was desperately lacking last year," he said. "He was one of the kids with Mike Panos who came up to me at the end of last year and said 'Coach what can we do to make this team better next year?' As a coach, that kind of blows you away. "They aren't thinking about themselves or their own agenda. They were thinking of team first. They knew they didn't want to repeat that (last year). They put the team first. "MJ even displayed that even at the end of last year. He played practice ball in the fall, did the indoor stuff and made sure everyone was ready." As the interview came to a close, Bigler was asked if there was anything else he would like to add. "He's a great spirit. He's a fun kid," he said. "He knows when to laugh at himself. He knows when to be serious, he knows when to relax. "You know he's going to be successful in life because he makes everyone better." FAVORITE FOOD: BBQ Buffalo Wings. FAVORITE MUSIC: M & M, Rap. FAVORITE MOVIE: Sports and Action movies. FAVORITE TV SHOW: Big Bang Theory. WHAT DO YOU DO TO RELAX? Watch TV, play video games or take batting practice. MOST MEMORABLE MOMENT: Finals of GMC consolation, beat Menomonee Falls, MJ had a 3-run HR. WHAT DO YOU WANT TO DO IN THE FUTURE: Attend St. Thomas University and play baseball. Be a lawyer if he couldn't play professional baseball, even in the minors.